As part of a nationwide call-to-action, United Way of Central Carolinas is holding a "Stuff the Bus" drive next week at various locations around Charlotte where you'll be able to donate items for the city's homeless population. More than 6,550 people in the Charlotte-Mecklenburg area are homeless, according to the agency. I attended a United Way Young Leaders breakfast last month and one of the speakers made a remark that really resonated with me. 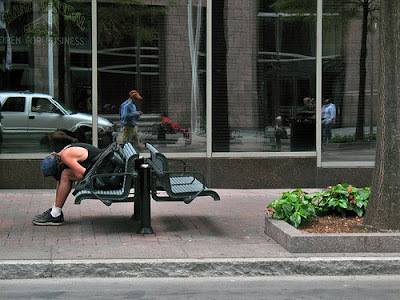 The homeless people we encounter on street corners account for only about 15 percent of the homeless population. They often turn us off with their begging, which is usually tied to drug or alcohol addiction, but most of the homeless are hardworking people who just happen to have had bad breaks in life. They might be the people bagging our groceries at the store or taking our order at a fast food restaurant. They're working but they're not earning enough money to provide a home for themselves and their families. You can help Charlotte's homeless by dropping off needed toiletries for homeless shelters in our community. This drive will kick off Monday, June 22 and end Friday, June 26. Below are the list of locations with dates and times. •Monday, 8 a.m.-5 p.m., The Plaza at Two Wachovia Center, 301 S. Tryon St.
•Friday, 8 a.m.-5 p.m., United Way of Central Carolinas, 301 South Brevard St.
• Men: toiletries, new towels and wash cloths, new underwear (briefs in sizes large-6XL), shower shoes, and new socks. •Women: toiletries, shower shoes, disposable diapers in all sizes, baby wipes, 60 gallon trash bags (to carry clothes). United Way of Central Carolinas serves a five-county region of Anson, Cabarrus, Mecklenburg, and Union counties and the Mooresville-Lake Norman area. For more information, visit www.uwcentralcarolinas.org.